Marine Sergeant Bill Morris with his new travel trailer courtesy of Hope For The Warriors and it’s a Warrior’s Wish program. For video and more photos, visit: https://bit.ly/2sVrVXe. CHARLOTTE, N.C. (June 14, 2018) – Since separating from the Marines, camping and time outdoors has provided a place of serenity for the father of four and his family, but has become more difficult due to his combat injuries. A new travel trailer, given to Wilmington-based Sergeant Bill Morris through A Warrior’s Wish® by Hope For The Warriors®, now provides a more accommodating environment, furnishing him the freedom to camp with his family once again. 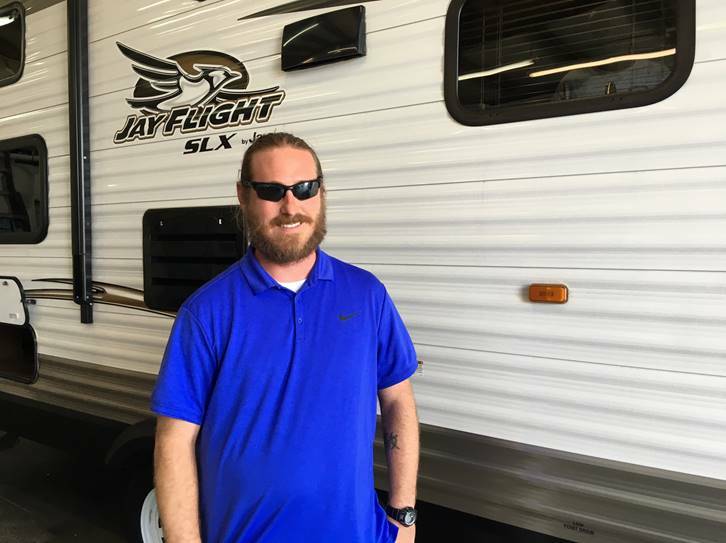 Working with Hope For The Warriors, Terrell Camping Center provided a discount on the 2016 Jayco Flight SLX 267BHSW trailer. In 2004, Morris enlisted in the Marines and later served deployments to Iraq and Afghanistan. On December 15, 2011 Morris was knocked unconscious from an improvised explosive device. Upon returning home, Morris received additional treatment for his injuries and was given orders to attend a traumatic brain injury (TBI) research study at Naval Air Station, Pensacola, Florida. He and a fellow Marine traveled from North Carolina and were approaching the base when their vehicle was involved in a serious motor vehicle accident. Between 2012 and 2014, Morris was assigned to the Wounded Warrior Battalion East (WWBnE) at Camp Lejeune. After 9 years, 11 months, and seven days in the United States Marine Corps, Morris medically retired. Since the program’s inception, A Warrior’s Wish has granted 184 wishes. To apply for a wish, visit hopeforthewarriors.org/story/19331538/a-warriors-wish and register online. For video and more photos, visit: https://bit.ly/2sVrVXe.